Our first 'Ryan' cuvee was born from a desire to capture the essence of mature vine, Californian-clone, Green Valley Pinot. 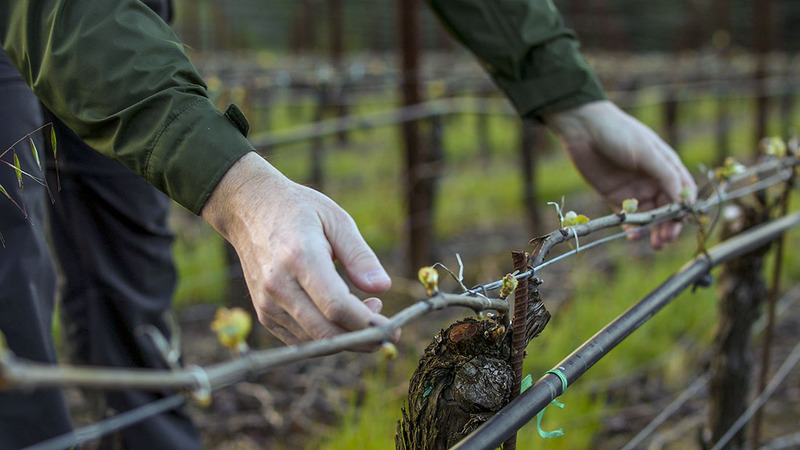 The foundation of the wine is the Widdoes Vineyard, which since our inception in 1996 has been our core pinot vineyard and the backbone of many DuMol bottlings. O'Connor and Jewell vineyards, together with Widdoes, lie within half a mile of each other, atop our wonderfully exposed Green Valley ridgelines. All three contribute strong individual personalities to the blend making a powerful yet harmonious combination. Widdoes is earthy and dark in its brooding, structured style; O'Connor is gamey, explosively aromatic and primary; Jewell is densely fruity with wild berries and anise. All three are united by their ability to produce site-driven wines that transcend simple fruitiness, producing flavors more reminiscent of Europe than fruity Californian Pinot. The highlight of the 2002 Green Valley growing season was the relatively cool July & August during which long foggy mornings slowed vine development, created an extended veraison period and mitigated the need for regular irrigation. This ultimately had the effect of keeping berry size small with thick skins rich in coloring material. Crop thinning was essential to tighten the fruit maturity window and ensure uniform ripening. Heat early in the year had the effect of hastening stem lignification and the long season produced highly desirable dark woody material, perfect for the fermenter. A blend of four individual harvest lots and fermentations, our 'Ryan' cuvee was exclusively native yeast fermented with between 10% and 20% whole clusters which amplify the natural earthy, gamey vineyard characters adding a spicy olive tapenade note. The blend was assembled after eleven months on the lees and returned to 66% new fine-grained moderately toasted Burgundian oak for an additional four months. Our traditionally longer elevage helps round out the more structured style, concentrating the palate and lengthening the complex finish. A fully saturated dark ruby color precedes a hugely complex nose of wild dark berries, pepper and game. These flavors continue on the palate with black raspberry liqueur, sweet kirsch and anise, with a slight fresh mint edge. The wine's dark extract and sweet fruit core are supported by rich assertive tannins and vibrant acid which lift the finish leaving a lingering impression of dried plum and sappy pinot fruit. With cellar time this bottling will further concentrate which will intensify the Green Valley terroir characters of game, earth and dark cherry. The whole cluster influence will further steer the development toward truffle and nicoise olive. Anticipate continued development over five years and cellar for up to ten.